My interests are in the area of heterogeneous atmospheric chemistry, focusing on the chemical, physical, and optical properties of atmospheric aerosols. In addition to fundamental studies of particles, we are also exploring how atmospheric aerosols impact current problems such as stratospheric ozone depletion, global climate change, urban smog, and visibility degradation. Research in the Tolbert group is not limited to studies of atmospheric aerosols on the current-day Earth. We are also probing the particles that might have been present at the earliest times in Earth’s history. We are interested in how these particles might have impacted the climate of early Earth and the development of life on Earth. As a parallel to early Earth, we are also studying aerosols and clouds on other planetary bodies such as Mars and Saturn’s moon Titan. Our work is primarily laboratory based, but involves collaborations with theory teams and those involved in fieldwork. Our primary support comes from the National Science Foundation and NASA. NASA Mars Rover Team - Dr. Raina Gough has been selected to be part of a team of 28 scientists to work on NASA's Curiosity Rover in Mars. Her laboratory studies on deliquescence, the process where a crystalline salt picks up atmoshperic water and turn into a solution, has shown that briney solutions can be stable and possibly exist for certain times on the surface of Mars. If salty solutions exist on Mars, it would mean that liquid water, which is essential to life as we know it, is also present. It is known that water exists on the surface of Mars, but currently only ice and water vapor (in the form of humidity) has been confirmed. Liquid water has yet to be confirmed nor encounted by the Curiosity Rover. Raina's work will provide more insight to the possibility of liquid water on Mars and potentially to life on Mars. For more informatio check out these articles from CIRES and NASA about Raina and the science team for Curiosity. Recent Graduate - Raea Hicks. A recent graduate of the Tolbert group, Raea's research focused on understanding the conversion of planetary atmospheric gases into aerosols. To do this, she first made aerosol analogs by initiating photochemistry in gas mixtures relevant to the atmospheres of Titan and early Earth, then analyzed the products in situ with a specialized instrument called an aerosol mass spectrometer (AMS). Specifically, she used isotopic labeling to determine the roles played by CH4 and CO2 in contributing carbon to early Earth aerosol analogs, and performed studies to deduce the role of pressure in nitrogen incorporation into Titan aerosol analogs. As each study involved a different non-standard use of the AMS, Raea created new techniques to perform the experiments and analyze the data. Now a post-doc at the Pacific Northwest National Laboratory, Raea leverages her expertise in non-standard AMS applications to address questions related to soil science. In particular, she hopes to discover factors that control the conversion of carbon from soil organic matter to greenhouse gases. Where are they now? Dr. Danielle Nuding has taken a position as a Systems Engineer at the Jet Propulsion Laboratory in Pasadena, CA. Dr. Nuding will be working on mission development for assigned JPL flight projects, which will include developing systems and mission level architectures. Dr. Gregg Schill was awarded a National Science Foundation Postdoctoral Research Fellowship and will be working with Prof. Paul DeMott at Colorado State University in Fort Collins, CO. Dr. Schill will be continuing ice nucleation studies, but on ambient aerosol from biomass burning and fossil fuel combustion. Dr. Kyle Zarzana will join Dr. Steve Brown's group at the NOAA Earth System Research Laboratory in Boulder, CO. Dr. Zarzana will be using cavity enhanced spectroscopy to study glyoxal and other traces gases. The University of Colorado Board of Regents awarded Margaret Tolbert, Ph.D., a Fellow of the Cooperative Institute for Research in Environmental Sciences (CIRES), and two other CU professors the university’s highest faculty honor, designation as Distinguished Professor, Friday, Sept., 17, 2010. Distinguished Professors are CU faculty members who are leaders in their fields and are recognized for their outstanding contributions in teaching, research and distinguished scholarship or creative work. To date, 56 professors across the CU system hold the title. Davis R.D., S. Lance, J.A. Gordon, and M.A. Tolbert (2015), Long Working-Distance Opticall Trap for in Situ Analysis of Contact-Induced Phase Transformations, Analytical Chemistry, 87, 6186-6194, doi:10.1021/acs.analchem.5b00809. Hicks R.K., D.A. Day, J.L. Jimenez, and M.A. Tolbert (2015), Elemental Analysis of Complex Organic Aerosol Using Isotopic Labeling and Unit-Resolution Mass Spectrometry, Analytical Chemistry, 87, 2741-2747, doi:10.1021/ac504014g. By: Horst, Sarah M.; Yoon, Y. Heidi; Ugelow, Melissa S.; et al. By: Gough, R. V.; Wong, J.; Dickson, J. L.; et al. By: Nuding, Danielle L.; Gough, Raina V.; Venkateswaran, Kasthuri J.; et al. By: Ugelow, Melissa S.; Zarzana, Kyle J.; Day, Douglas A.; et al. By: Primm, K. M.; Gough, R. V.; Chevrier, V. F.; et al. By: Davis, Ryan D.; Tolbert, Margaret A. By: Thalman, Ryan; Zarzana, Kyle J.; Tolbert, Margaret A.; et al. By: Hicks, Raea K.; Day, Douglas A.; Jimenez, Jose L.; et al. Qualified students interested in becoming a member of the Tolbert group should apply to the University of Colorado Boulder through the Department of Chemistry and Biochemistry. Details can be found on the Department's web site on Graduate Programs. If you’re already a CU student and interested in our group, feel free to contact anyone in the group for more information about us or to attend our weekly meetings on Tuesday 1 - 3pm in CIRES 340 (Map Room)! I am a professor in Chemistry at the University of Colorado in Boulder. 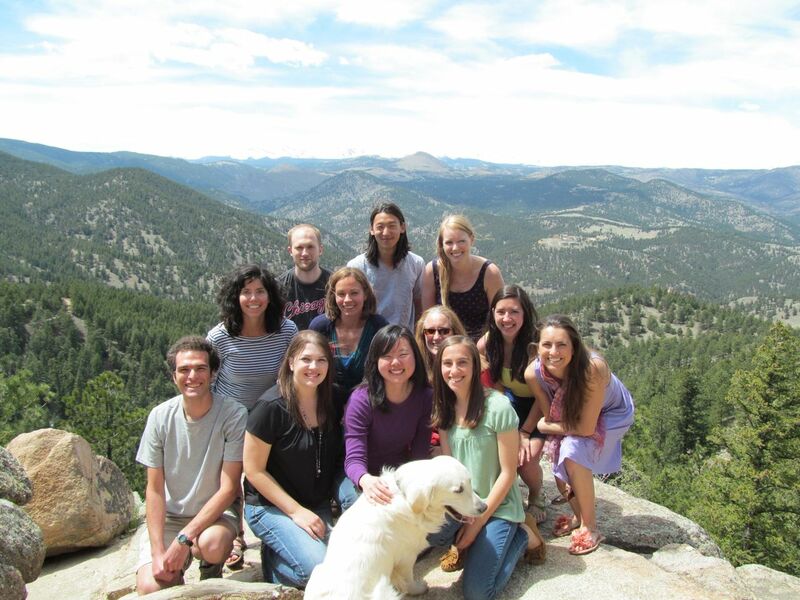 My research group focuses on clouds and aerosols in atmospheric chemistry.